Ferengi who sought new opportunities in the mirror universe. Briefly romantically involved with the Intendant. Counted on Quark to help him. Acquisition Greed x2 Maihar'du (if in or ). Valuable Prisoner Oo-mox (if with The Intendant). 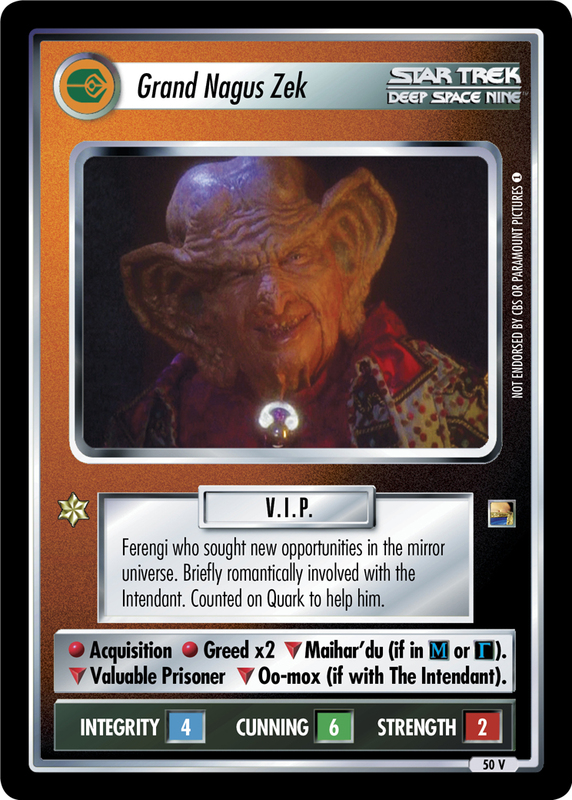 Characteristics: "Reshape the Quadrant"-related cards, affiliation, Nagus, "Mirror universe"-related personnel, "Quark"-related personnel, "The Intendant"-related personnel, Ferengi species, romantic partner. Requires: Mission, Intendant, "The Intendant"-related personnel. Card logging info: First edited by Telak at Mar 15th, 2016. Please support openCards and validate game text of this card!